It's been a while since I've posted but I've been busy. Not much progress for the time involved but at least the build is going forward albeit with several steps back. I've painted the wheelhouse inside and out. It's taken a lot of effort to get to the finish in the photos below, lots of rubbing down and repainting as I've struggled to get a decent finish. As it is it still needs flatting down and then polishing back up with rubbing compound and then polish. 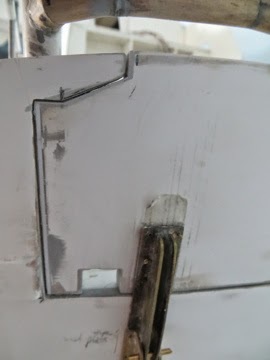 There's an issue with the hull paint too! I painted it with Halfords Gloss Appliance White and left it several weeks to dry. But, and it's a big but, the stand is marking the hull. I've tried mouse map as recommended by Model Slipway, masking tape on top of the mouse mat and felt. The felt is better then the others but still leaving marks. 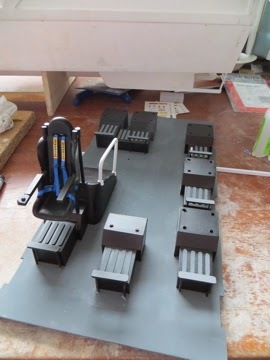 I'm now thinking of a stand redesign to spread the boat's weight over the stand better in the hope that will work! This is something I've been scratching my head about for a while. It's how to make a replacement grill for the port engine intake. 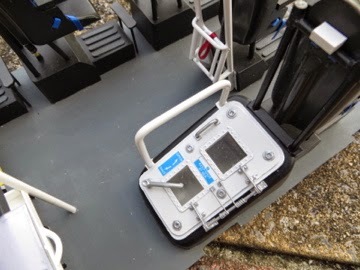 This is needed following my modification to enlarge the intake as per the full size boat so that it extends down under the flybridge floor (insert link). I'm trying to get the cabin to a stage where it can be painted. As usual though, just when I think I've thought of everything that first needs doing, there's more to add to the list. And today the weather broke, so out with the sunny and perfect spray painting conditions and in with rain. So painting is postponed anyway! After the long job of the cabin interior, I've been adding bits and pieces to the cabin. 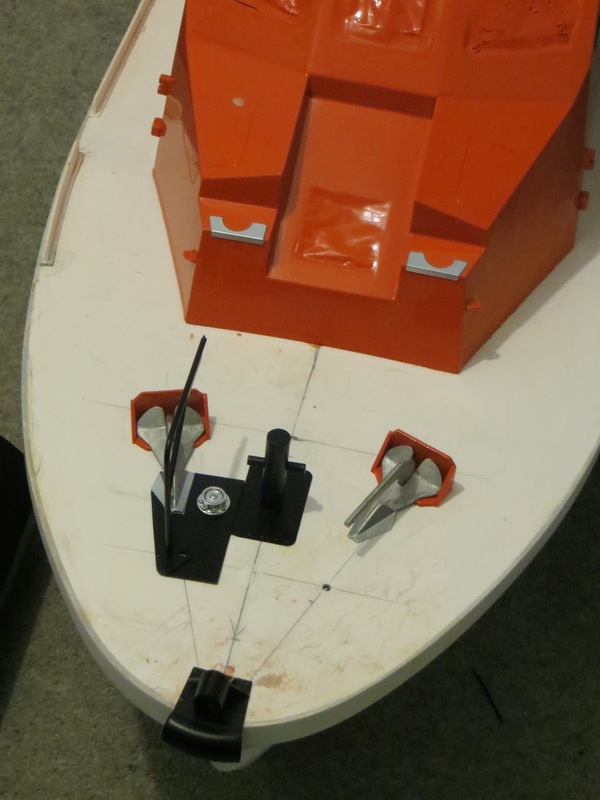 So, the holes are now drilled for the whip aerials, the boat hook boxes are fitted and the safety line anchor points are marked. I'll add these last as they are white metal and got a bit knocked on the Trent. I've also been making the brackets for the comms speakers as these are quite prominent on the front of the wheelhouse, although less so at the stern. 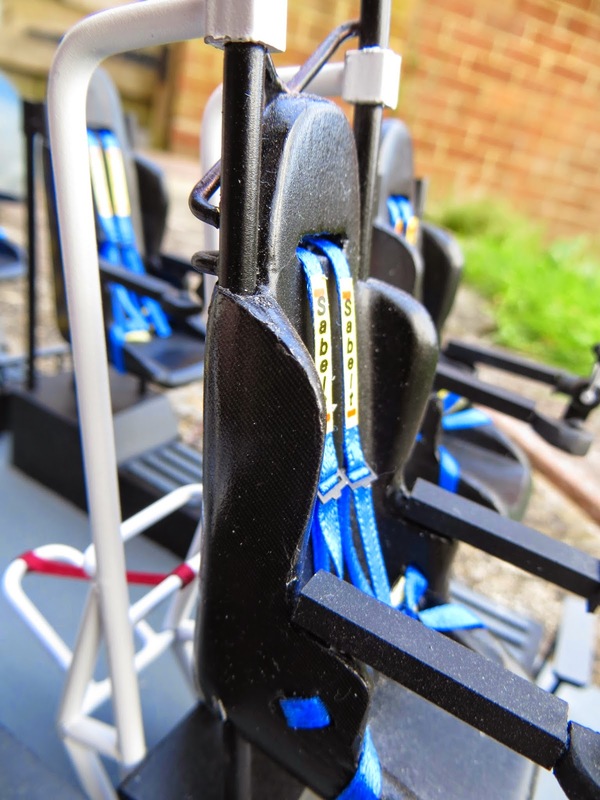 These will be painted on the inward face and then glued to the cabin as it would be difficult to ger full paint coverage once they're attached. I'm hoping that all that's now left to add are the vac form radome and the SIMS screen for the flying bridge/USP. 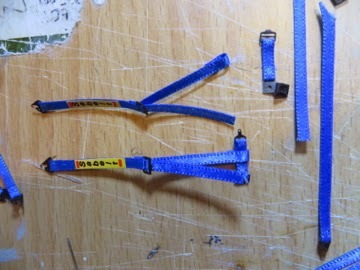 I'm using a keyring digital photoframe but need to wire it up for a remote switch and battery box. So, at long last I've finished the wheelhouse interior. Or at least I hope I have! 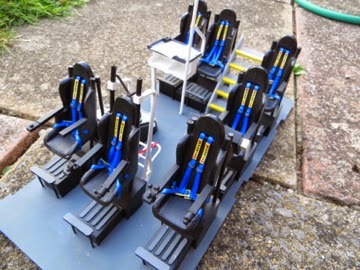 I also altered the seat layout from what's printed on the cabin floor. 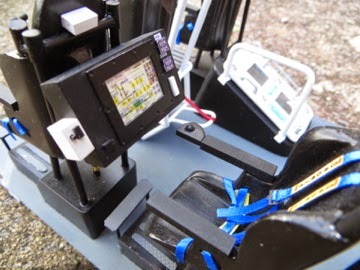 That meant the doctor and nav 2 seats are too far back to slide the floor in using the kit tab system. 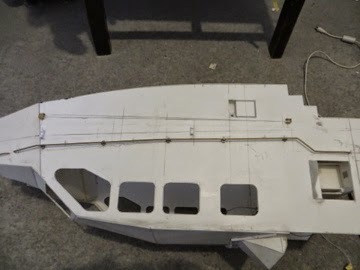 So, I've added squares of styrene to the floor and correspondingly on the underside of the wheelhouse which are pinned through. Also, the floor had warped in both planes so I've used steel rod to add strength and correct the warp instead of the ribs from the kit. The underside of the floor's a bit of a mess but no-one's going to see it! 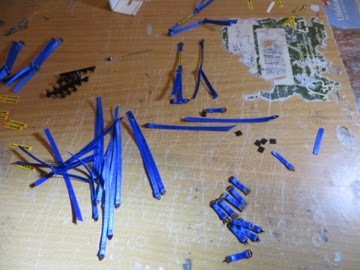 The two wires are for the LED in the engineer's console. I've been busy doing bits and pieces to the Tamar but also being distracted by other projects. 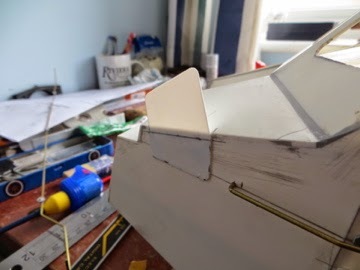 Work still continues on the wheelhouse interior but on a changes of tack, I decided to try to get the wheelhouse itself ready for painting in the hope of some reasonable spray painting weather this summer. It's surprising just how much work remains. 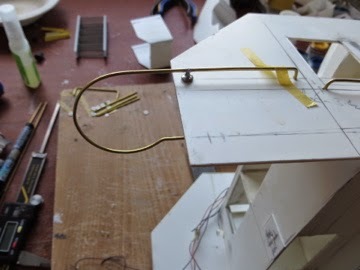 I also wanted to work out the mast servo linkage so that can be planned and as much installed as possible pre-painting. That's still causing a little head scratching. 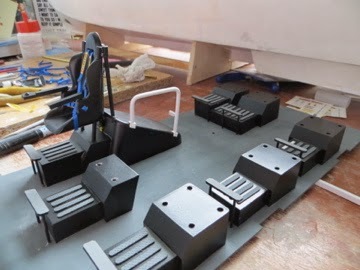 Still, I've made up the rear section of railing on the wheelhouse that goes around the pump box. The curved section was formed first using a suitable sized former; in this case a small glass bottle. The storage boxes don't open, but I wasn't happy simply drawing a line on after painting to represent them. 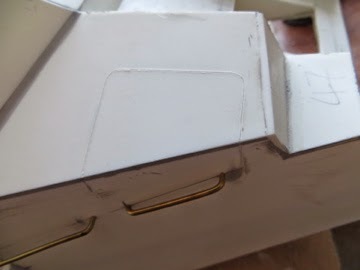 So, using a template from 0.5mm styrene, I scribed the shut lines. 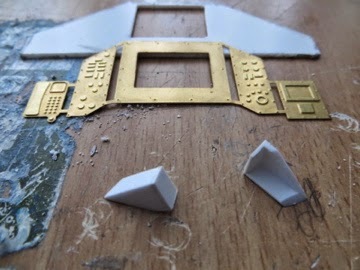 To stop the template slipping I tack glued them in place although used a little too much glue on one side. So, filler was used to hide the battle scars. Also done is the rail on the front storage boxes. I have to adjust the length of the main railing sections, hence small filled holes as they were slightly too short. So progress has been a little slow of late for a reason. I was cycling to work one day in December and a car decided it wanted to join me in the bus lane. I braked to avoid him/her and the bike skidded and went from under me. Cue several trips to hospital, a screw in my right scaffoid and a rather natty plaster. 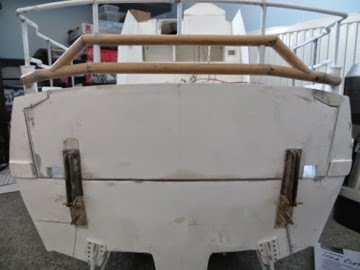 So my boat building has been somewhat limited, and will be for at least 6 more weeks. 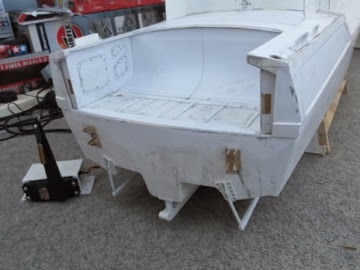 Had been working on rebuilding and the fitting the Y-boat recess; which I'd mostly finished before being put in cast. Since the rebuild is essentially what I'd built earlier, but with with extra care taken, I've not got a separate picture of that. What I do have though is pic of it being held in place during fitting. 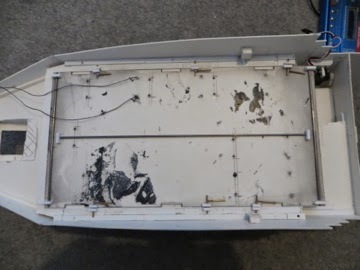 I used styrene glue on the join with the transom itself onto the supporting strip and epoxy to glued to the underside of the deck. 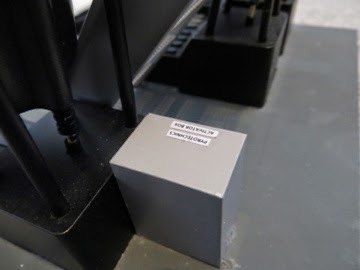 The 6x3mm styrene support strip I'd added to the back of the recess itself in order to keep the structure rigid came in handy for giving the clamps something to grip! Now here's the finished article, filled and smoothed in. I glued 1mm styrene underneath the deck to give a smooth finish there. 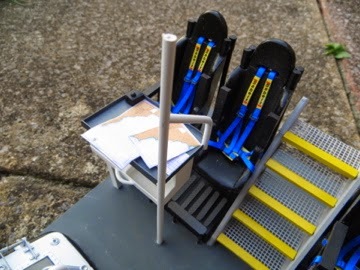 I've also put the servo which will be used to operate the door in shot. 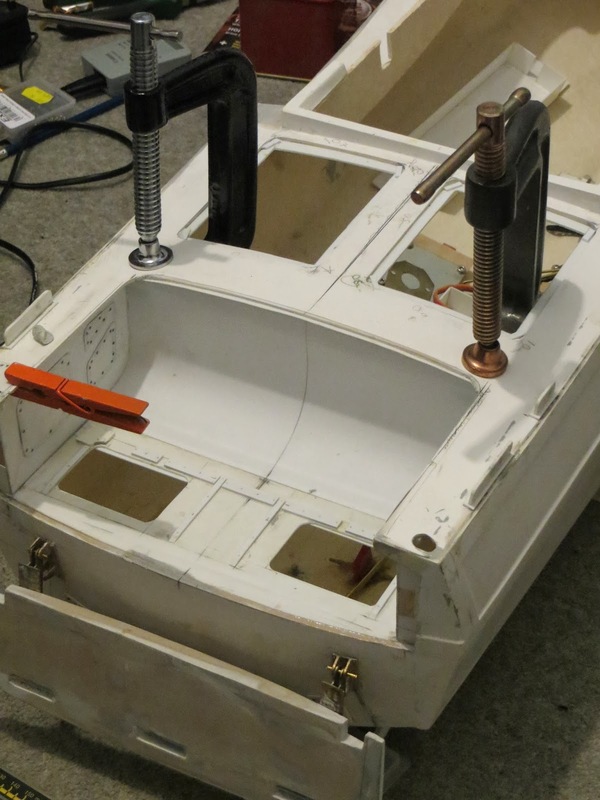 I've made a bracket for the servo from styrene and that screws onto plywood mounts epoxied into the hull. Just a few bits to finish off in there now, the support brackets, what appears to be a step and the plumbing/wiring at the fore end of the recess. Hopefully those are bits I can do with one arm in plaster!